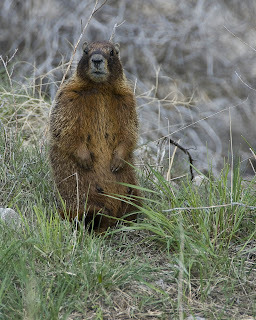 Dispatches From Kansas: Yellow-bellied marmot--not to be confused with yellow-bellied politicians. Yellow-bellied marmot--not to be confused with yellow-bellied politicians. Well, now, some politicos bear an amazing resemblance to this marmot - no reflection on the poor, innocent beastie. Good shot, Tom!